The house once known as number 4 St John Street in Thornbury has long since gone, having been demolished in the late 1970s to make way for Quaker Court sheltered housing complex. The photograph above shows it in the 1950s when it was owned by the Wilkinson family (see below). We are aware of an earlier indenture dated 6th November 1723 when Charles Cossham bought the property from Edward Hill of Longashton in Somerset, gentleman, but we haven’t yet had chance to view this document at Gloucester Records Office. According to Susan Dean’s book ‘The Cossham Story’ Charles was born about 1693, the son of Charles Cossham and his wife, Sarah. In accordance with his father’s will dated 21st November 1721, Charles inherited his father’s tools. On 27th December 1713 Charles married Ann Parker. They had two sons, George baptised on 3rd October 1714 and James baptised on 20th October 1721 and three other children baptised on 4th May 1722: Sarah, Charles and Joseph. We don’t know what happened to Ann, but Charles married again on 11th June 1729. His second wife was Sarah Butler. It is interesting to see that by the time of the 1840 Tithe Survey the property was still in the hands of Wetmore family. Thomas Osborne Wetmore was the owner in 1840. On 24th July 1848 Thomas Osborne Wetmore sold the property to Hester Prewett, the wife of James Prewett, the carrier. In the course of the next few years, Hester arranged various mortgages, the last one with John Crowther Gwynn, which she had some difficulty in repaying. The property was put up for sale at auction in 1859 when it was described as : ‘All that substantially built freehold dwelling house with the courtyard behind the same situated on the south-west side of St John Street in the town of Thornbury and now in the occupation of Aaron Tidman. The above house comprised two front sitting rooms, kitchen and back kitchen, five bedrooms and a good cellar’. The sale in 1859 failed to find a buyer and Hester still owed John Crowther Gwynn £100 plus interest. On 16th March 1860 Hester agreed to sell the property to him. The Rate Books of 1876 and 1880 show that J C Gwynn owned the property. At that period it was described as a house and yard. The property was rented to George Thomas who in the 1877 Trade directory was a baker. The 1861 census shows that George Thomas was living in St John Street and operating as a baker at that time. Thus it would appear that he was the first baker to operate from the premises which continued as a baker for over 100 years. By 1885 the owners of the property were described as the “Trustees of the late J C Gwynn”. This continued until 28th October 1898 when Thomas Eldridge English purchased the property for £300. Ernest Joseph Pearce – Ernest bought the bakery for £850 on 17th November 1934 and ran it until 1937. Ernest was born in Lower Morton in 1902. The 1911 Census shows him living in Lower Morton with five siblings and his parents Joseph Pearce a farm labourer and his wife Sarah. Joseph was from Littleton but his wife Sarah was from Olveston. Ernest Joseph and his wife, Alice Elizabeth, moved to the bakery from The Bungalow, Siblands. Alice was the daughter of William Short, the railwayman and his wife, Florence Matilda (nee Burchell). We have been told by a family member that the photograph on the right is of Ernest Pearce with his delivery van (which was still bearing the name of the previous owner, T. E. English). John Victor Spencer – took over the bakery on 8th February 1937. 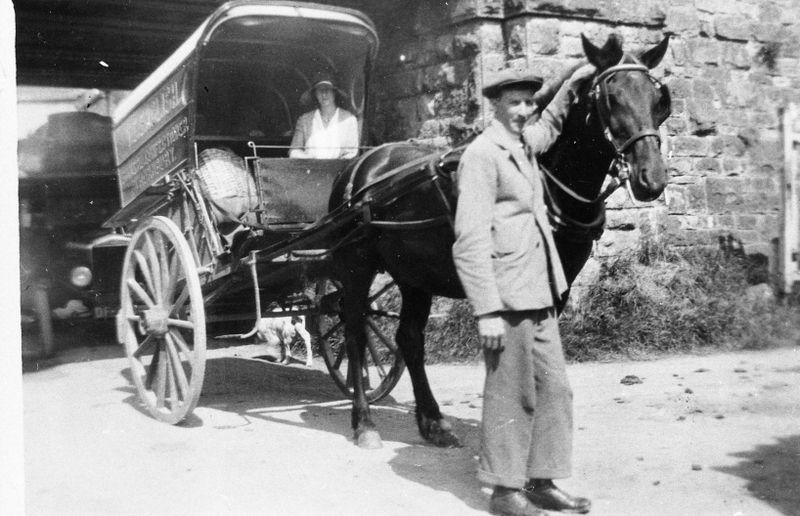 The conveyance shows John as a baker from Tockington. John and his wife, Grace Emily Spencer, are listed in the electoral register of 1939. John was born in Brinkworth, Wiltshire on 26th September 1893. He was the son of Garibaldi John Spencer, a baker and farmer and his wife, Mary E. In 1918 John married Grace Emily Carter. Grace was born on 16th September 1894. She was the daughter of John Carter, a builder and his wife, Emily. In the 1911 census the Carters were living at 170 Cheltenham Road. They seem to have had three daughters: the marriage register of St Mary’s Church shows that all three of them married in 1946. Barbara married Ronald Roper of Eastland Avenue, and a week later Joan Hazel Mary, married Stanley Norman Hampton of Rogerstone. A few months later on August 22nd 1946 Doreen Norma Christine Spencer married Kenneth Sams of Whitfield. It is interesting to note that John was born in Malmesbury, Wiltshire in 1893. He was the son of Garibaldi John Spencer, who was also a baker. We have not found any obvious connection between John and the English family who also stemmed from Malmesbury. The special register compiled in 1939 in preparation for the war describes John as a master baker and cake maker. Grace was described as book keeper. John operated it until 1947. We don’t know where the Spencers went after leaving the shop, although the Pitcher’s accounts book shows that they arranged John Victor’s funeral when he died in November 1980 aged 88 and Grace Emily’s when she died in July 1981 aged 86. Cyril Wilkinson – took over the bakery on 8th February 1947. He paid John Victor Spencer £6300, of which £4000 was for the property, £1400 for the goodwill of the business as a baker and confectionary and £900 for three vans and loose effects. Cyril was born in Bristol in 1909. He was the son of William Wilkinson, a baker and his first wife. Cyril married Kate Miles in the Bristol area in 1931. They had a daughter, Catherine M. born in 1934, Marion born in 1939 who died young and twins, David J and Mary Elizabeth born in 1943.
ristol and the other at Hengrove, Bristol. When he purchased the Thornbury business in 1947 he was living at 137 Parson Street, Bristol. When they moved to Thornbury Cyril appeared to have had big plans to extend the business. He submitted plans to build to build a ‘model’ bakery in the orchard which they rented from the Council. This orchard was further along St John Street towards Pullins Green and went through to St Mary Street. Looking at later maps of the area, this building was never built, but it seems like they did build a new bakery at the rear of their shop. Cyril and Kate also moved next door to live at number 6 St John Street whilst carrying on with the shop. They are shown in the electoral registers of 1954 onwards as living in number 6. The electoral registers show that they lived in St John Street until at least 1965, after which their son, David, took over for a short while with his wife, Patricia. David and Patricia are listed in the 1970 electoral register. An indenture dated 12th November 1969 shows Cyril and Kate had moved to live at 301 Wells Road, Bristol when they leased out the bakery and number 6 St John Street to David. On 12th February 1973 the Wilkinsons sold the bakery and the house to their son, David. It appears that David didn’t wish to continue with the bakery and on 15th May 1973 it was let to Cotswold Storage Systems Limited. On 4th June 1964 Cyril’s daughter, Mary, married Michael Frederick Holmes, a corporal in the Parachute Regiment who came from Bradford. On 6th March 1974 the bakery, and the house at 6 St John Street, were sold by David John Wilkinson to Thornbury Rural District Council for £27,500. 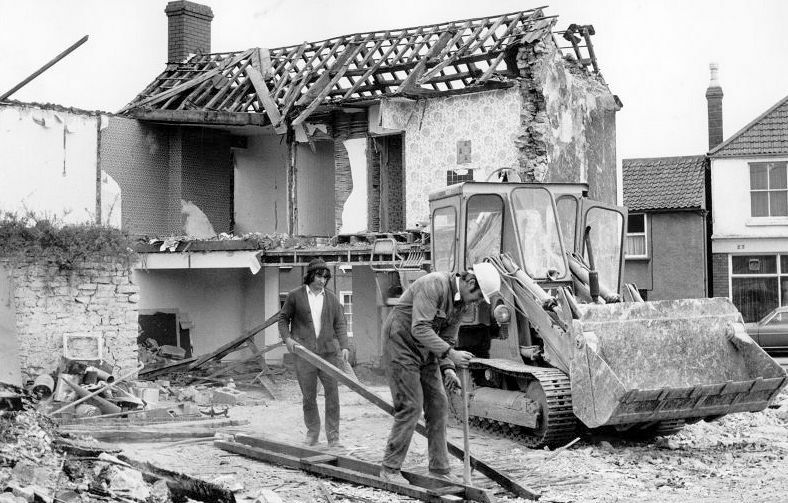 Both properties were subsequently demolished and replaced by Quaker Court residential home for the elderly. We have two photos of the house being demolished taken by Nick Large who kindly gave us permission to use them: click on the thumbnails above to see larger images.